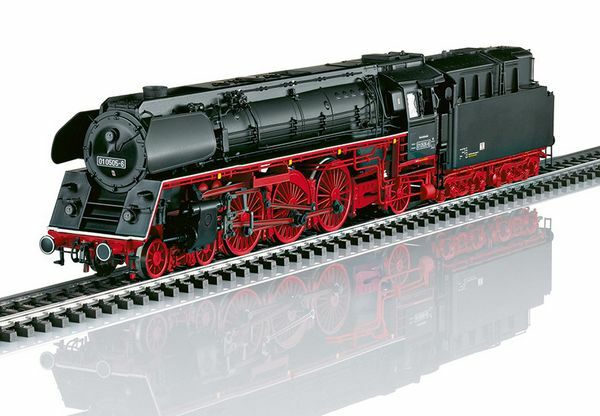 Model:The locomotive has an mfx+ digital decoder and extensive sound functions. It also has controlled high-efficiency propulsion with a flywheel, mounted in the boiler. 3 axles powered. Traction tires. The locomotive and tender are constructed mostly of metal. The 7226 smoke unit can be installed in the locomotive. The triple headlights change over with the direction of travel. They and the smoke unit that can be installed in the locomotive will work in conventional operation and can be controlled digitally. The cab lights can also be controlled digitally. Maintenance-free warm white LEDs are used for the lighting. There is a close coupling with a guide mechanism between the locomotive and tender. There is a close coupler with an NEM pocket on the tender. - Especially finely detailed metal construction. - Decorative striping on the buffer supports and running boards. - Partially open bar frame and many separately applied details. - mfx+ World of Operation decoder and extensive operational and sound functions included. - For still more operating enjoyment in the Märklin "World of Operation". A note of advise: Due the way the plastic holder protection this locomotive uses, the front part of it touches the front sign on the boiler of the locomotive that holds the road number 01-0505-6. We have received notices that this sign, a very small black sign, may fall from its support base and fall inside the plastic box. Remove slowly the plastic covers that holds the locomotive and search for this small piece of black plastic with the road number on it. You will need to just glue it back on position and you are done.